There's a reason so many science fiction and fantasy shows feature trials. Legal battles can be used as an allegory, or a way to expose important issues. But sometimes, these stories just go off the deep end. Here are the most ridiculous trials from science fiction and fantasy television. Both writers and viewers love a good courtroom scene. They can show the triumph of justice, or how venal and corrupt a system is. There's a weird dichotomy in the view of the legal system (at least in America): There are 456 episodes of JUST the original Law & Order, but the population really doesn't like or trust lawyers. Also, trials are great fictional devices, because they come with a ready-made structure: opening statements, witnesses, dramatic cross-examinations, passionate arguments, and the delivery of a judgment. Some people have used that structure to expose fascinating arguments. And others... others just got weird with it. Farscape, "Dream a Little Dream"
This episode takes place on a planet of lawyers called Litigara. And the name isn't even the most insane part. Lawyers are 90% of the population of Litigara. Just, how does this planet even function? How do you have food, power, even buildings on this planet? Does it import everything and just leave 10% of the population to maintain it? If you get sick, do you go to the next planet over? (Which, we must assume, is called "Medicala.") Then there are the rules of legal proceedings we see during Zhaan's trial: A) The lawyer won't represent her if she pleads not guilty; B) She can't change her plea without representation; C) Lawyers share in the penalty given to their clients; D) Lawyers can have their clients gagged; E) The basis of their legal system is that light is brighter in the presence of lies. Yes, it's a planet of complicated and byzantine laws, all of which are defeated by a superstition. Star Trek, TOS - "The Wolf in the Fold"; TNG - "The Devil's Due"; Voyager - "Author, Author"
There are a lot of trials in Star Trek. A lot. Some of them (*cough* "The Measure of a Man" *cough*) are great. And then there are these. "The Wolf in the Fold" involves Kirk and co. having to prove that Scotty's innocent of being Jack the Ripper. "The Devil's Due" has a planet, Ventax II, whose inhabitants believe that their ancestors made a deal with their version of the Devil. Then a woman claiming to be the Devil shows up and, after a series of increasingly bizarre coincidences and legal precedent, Picard ends up having to prove she's not the Devil to Judge Data. Yes. That's a thing that happened. But let's turn now to Voyager. There are a number of problems with "Author, Author." 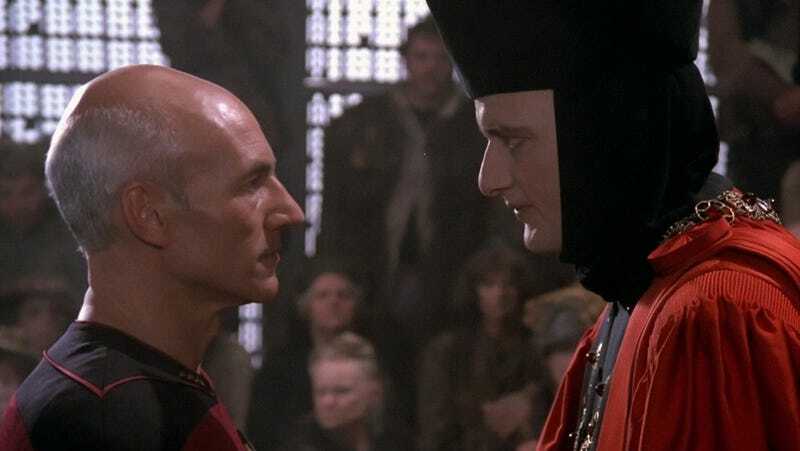 The first, most obvious, is how badly it fairs in comparison to TNG's "The Measure of a Man." Comparisons it invites, by also being an episode about whether an artifical lifeform is an actual person. But where TNG involved questions about what it means to be sentient and the ability to refuse being experimented on, Voyager involved intellectual property rights. Rights to a holoprogram called "Photons Be Free." Yeah. . . And then the episode comes to the conclusion that the Doctor isn't a person under Federation law, but is an artist. I take back the statement that this wasn't deep. Try contemplating "I am an artist, but I'm not a person" for a while. Honorable mention: Voyager's "Ex Post Facto" for calling a dog as a witness to a crime. And for showing just how useful the Vulcan mind meld is for lawyering. Doctor Who, "The Trial of a Time Lord"
Okay, so this one was an entire season built around the trial concept. The Doctor is hauled to Gallifrey to face charges, including interference with outside worlds - a prohibition that they're able to enforce, in a way that the Federation only dreams it could. But there's a feature of Time Lord legal procedure that is baffling: The Doctor is able to present evidence in his defense. Okay. He chooses to show an event from his future, hoping to show that he will be reformed. And here's where it gets confusing: if it's literally his future, as in, it takes place for him after this trial, will it still happen if he gets convicted? And even if he doesn't, won't it happen now because he showed it, so he'll have to act that way, which throws the idea that he's sincerely reformed into question. So why does Time Lord law allow him to show the future in court anyway? AND THEN there's the part where what the Doctor shows, in "Terror of the Vervoids," ends up getting him the added charge of genocide. A+ defense tactics, Doctor. Hercules: The Legendary Journeys, "Hercules On Trial"
A guy impersonates Hercules, dies, and Hercules is arrested — basically, for inspiring him to do that. Yeah. The questions about morality and whether Hercules has been doing the right thing are actually, surprisingly, interesting. The way he ends up in court? Stupid. Battlestar Galactica, "Crossroads Pts. 1 & 2"
Generally speaking, the trial of Gaius Baltar avoids a lot of legal proceeding scene pitfalls. Anyone not love Baltar yelling "Butterfingers!" at a guy who tried to kill him? And yet, it's just never going to be okay that one of the three judges is the father of one of the defense lawyers, the father doesn't recuse himself, and the defense lawyer is put on the stand to testify about things his father said about the accused. Which he then refuses to talk about. Just throw your hands up and slam your head on the desk, because that's a strategy that works. Stargate, "The Powers That Be"
Vala returns to a planet she once ruled as a God. When they people there find out she isn't a god, they put her on trial for her life with the judicial system she established. She didn't do this, but wouldn't you be a little concerned about putting the person who created your trial system on trial? Wouldn't you question its validity just a little? I mean, she named it a "Mal Doran," after herself. Game of Thrones, "And Now His Watch Is Ended"
There's some weird logic going on in Sandor Clegane's trial by combat after being charged by the Brotherhood Without Banners. Not the idea of trial by combat — that's an idea that's been around for awhile. If you win the battle, whatever higher power ascribed to has judged you innocent or not guilty or whatever. But in this case, Clegane beats Beric Dondarrion. Who is then brought back to life by the prayers of Thoros to the Lord of Light. Assuming that they believe in the supremacy of the Lord of Light, this leads to the conclusion that A) the Lord of Light judges in favor of Clegane B) Against Beric in the fight C) But still favors/requires Beric enough to bring him back from the dead, rather than just not letting him die in the first place. Fine. Whatever. Little confusing for a deity, is all I'm saying. Batman: The Animated Series, "Trial"
Great attempt to justify one's own existence or greatest attempt to justify one's own existence? Sliders, "Dead Man Sliding" - A world with trials as game shows, and lawyers are banned. No idea if this is better or worse than Litigara. Futurama - just generally. Every time there's a trial on this show, it's going to be absurd and hilarious. Stargate: Atlantis, "Inquisition" - Gotta love the team being put on trial for the expedition's crimes against the entire Pegasus Galaxy. Which, yeah. The clips kind of make the charges look true. Of course, they win by offering the only undecided member of the tribunal more than the other guys. Star Trek, "The Menagerie" - What do you do with your old unaired pilot episode? Use it as footage in a trial episode! "The Menagerie" stands out as proof that neither clip shows nor trial episodes are inherently bad. Charmed, "Crimes and Witch-Demeanors" - A) Just look at that pun, will you? B) Pretty similar to Stargate: Atlantis, really. Another clip show which seems to prove that the protagonists are really guilty.